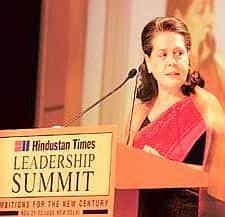 New Delhi: Ending any lingering hopes of realistic economic reforms in the United Progressive Alliance’s (UPA) remaining months in power, Congress president Sonia Gandhi sharply underscored the need for prudence and caution, and providing “basic security" to India’s poor. But speaking at the Hindustan Times Leadership Summit here on Friday, Gandhi, who is also chairperson of the UPA, harped on how her mother-in-law, former prime minister Indira Gandhi’s nationalization of Indian banks back in the 1960s, appears, some four decades later, as a wise move, a nod to significant government intervention in the West, especially in the US, in the current financial and markets crisis. “Every passing day bears out the wisdom of that decision," she claimed. “Public sector financial institutions have given our economy the stability and resilience we are now witnessing in the face of the economic slow down." Adding grist to the notion that economic reforms are all but dead, Gandhi had followed a speech by Prime Minister Manmohan Singh to expressed surprising—in light of persistent downgrades from multiple quarters—that India would be able to sustain an annual growth rate of 8% and overcome the global crisis. “Global economy is going through choppy waters; we can and we will surely survive," said Singh even as he mentioned a long list of priorities that India ought to get around to as it seeks a “middle path" of social and economic progress. Singh, who has been Prime Minister for well over four years now, added: “Moderation is not a call for rejection of boundless ambition." A national election is due by April 2009. Hours later, at the same forum, L.K. Advani, president of the Bharatiya Janata Party, blamed the UPA government for being in a denial mode about how almost all the sectors of the Indian economy are facing a grave crisis. In what is likely to be a recurring theme for the BJP as it seeks to regain power after a five-year hiatus, Advani said there is now an economic crisis of confidence prevailing in India and that could erode India’s economic gains of the past. Advani, who would like Singh’s job, said: “The UPA is not a coalition but a mere collection of independent fiefdoms of ministers doing whatever they want to in order to further their own personal agendas without any concern for the overall progress of the country and without any fear of the Prime Minister who has become a passive observer. 10 Janpath (Gandhi’s house) cannot be the most important address in a democracy like India. It should be 7 RCR (Race Course Road residence of the Prime Minister)." While pre-election rhetoric was widely expected from all three speakers and even as the Congress party has paid little more than lip service to reforms in recent months, the seemingly coordinated speeches by Singh and Gandhi left some industry executives in the audience disappointed, both in terms of absence of specifics as well as the harking back to pre-liberalization themes. “What we need is more reforms—not less—that give people a broader access to opportunities. We have to use markets where it make sense and regulations where they are needed," Nandan Nilekani, co-founder of Infosys Technologies Ltd, told Mint. Next week, Nilekani is unveiling an ambitious book titled “Imagining India" that lays out some key roadmaps for the future of the country. In a conversation with news broadcaster CNN-IBN, Nilekani also added: “The solution for half-done reforms is not to roll back but to move forward. We are still ambivalent about reforms. I find that unfortunate." Earlier, both Singh and Gandhi called for a more balanced approach to reforms emphasizing on protecting the vulnerable sections of the society from the current global economic crisis. Pointing out the poor are bearing the brunt of “the unchecked greed of the rich", Gandhi asked: “Should they then become the victims of the unchecked greed of bankers and businessmen?.. It is our duty to ensure that whatever action we take in response to the turmoil protects them." Ironically, despite the borrowing of rhetoric from the Left parties, Gandhi’s former allies were not in a mood to buy the talk. “Liberalization will continue despite what they said today. She defended (Indira Gandhi’s) nationalization of banks because she had to," said S. Sudhakar Reddy, deputy general secretary of the Communist Party of India.